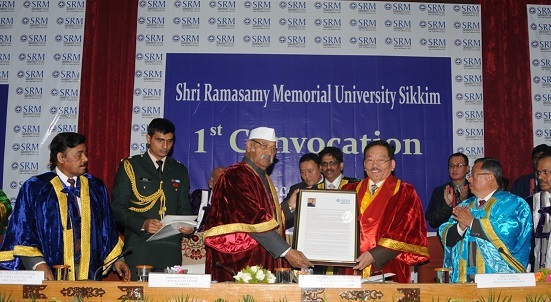 Sikkim chief minister Pawan Chamling was awarded the honorary D Litt degree on Wednesday at the first convocation of Shri Ramasamy Memorial University at Chintan Bhawan in gangtok. Governor Shriniwas Patil presided over the convocation programme and chief minister Pawan Chamling was present as the chief guest. Chief Minister said education is the single most important element in converting the young population into national assets. If the younger generation of the nation is empowered, it will constitute a very strong and productive workforce for the coming years, he added. He said the Human Resource Development Department has come out with several schemes underscoring the importance of inclusive education and the budget outlay for higher education has been increased. Chamling also made it a point that Sikkim is at the threshold of becoming fully literate by 2018 and the education related expenditure is also the highest in the country. Governor Patil, in his address, expressed hope that the students would apply their knowledge gathered during the studies to their daily life and to society. He said this journey should not end by acquiring a degree and they must move forward to achieve big things in life. Dr P Sathyanarayanan, the President of the institution and Founder Chancellor, Dr TR Paarivendhar also spoke on the occasion.